You can put on a school play to end all plays, depicting the Colonial era with startling accuracy, when you shop with Candy Apple Costumes. Every imaginable Colonial girl costume and Colonial boy costume is available, with all variations thereof. Every kids' Colonial costume is designed from high-quality materials and made for optimal comfort and the best fit. When your child wears one of our Colonial kids' costumes, they'll gain an appreciation for what it might have been like at that time in history. Plus, of course, it's fun! Our Colonial costumes for kids are as highly detailed as our adult costumes. 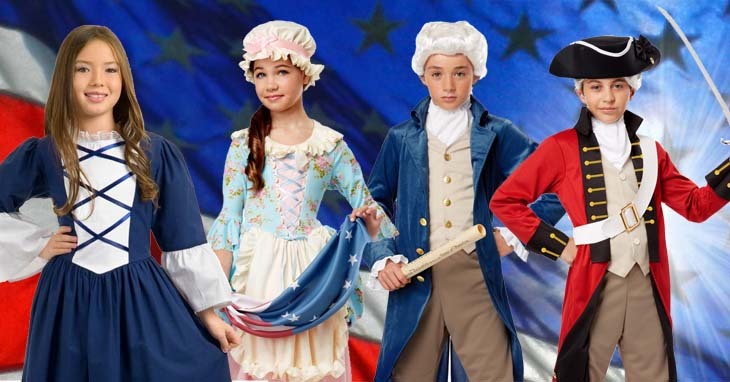 Dress up your child as an American hero or dethroned French monarch in our excellent selection of American Revolution and Colonial era costumes for girls and boys. You can opt for a specific historical figure like George Washington, Thomas Jefferson, Ben Franklin, Paul Revere, Betsy Ross, Martha Washington, Mozart, Beethoven, The Three Musketeers, Napoleon and Josephine and more. These Colonial costumes for boys and girls look like the real deal! Instead, perhaps, you may want such generic figures of that era as princess, general, pioneer girl, Colonial boy, Colonial girl, people of the French Revolution or a founding father. A solid selection of accessories is also available, such as 1700s style white wigs, tricorne and bicorn hats, toy weapons, ruffled collars and more. If you're on the hunt for something very specific, such as a Colonial soldier uniform in a kids' size, a Colonial ball dress girls' costume or Colonial Williamsburg children's costumes, chances are very good you'll find what you're looking for here. We have a much better selection than what you'd find elsewhere. Are you looking for a girls' size 12 Colonial lady dress? Sizes differ between costumes, which is why we include custom sizing charts for every product. As you shop, be sure to check each sizing chart to ensure the right fit. These charts frequently vary per item, so make no assumptions on this count! In the end, you will find a Colonial dress costume that is just right for your kid. All are made of durable quality, so it can double as next year's Halloween outfit and go on from there. We're happy to outfit you here at Candy Apple Costumes.